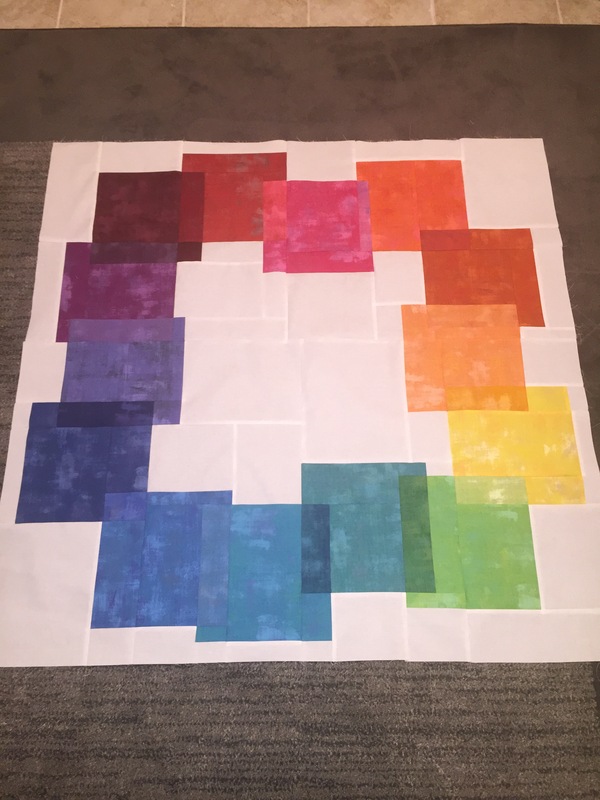 After a busy weekend sewing, I am so excited to share my quilt Spectrum. I originally had this idea as a QuiltCon 2016 submission but didn’t get my act together. 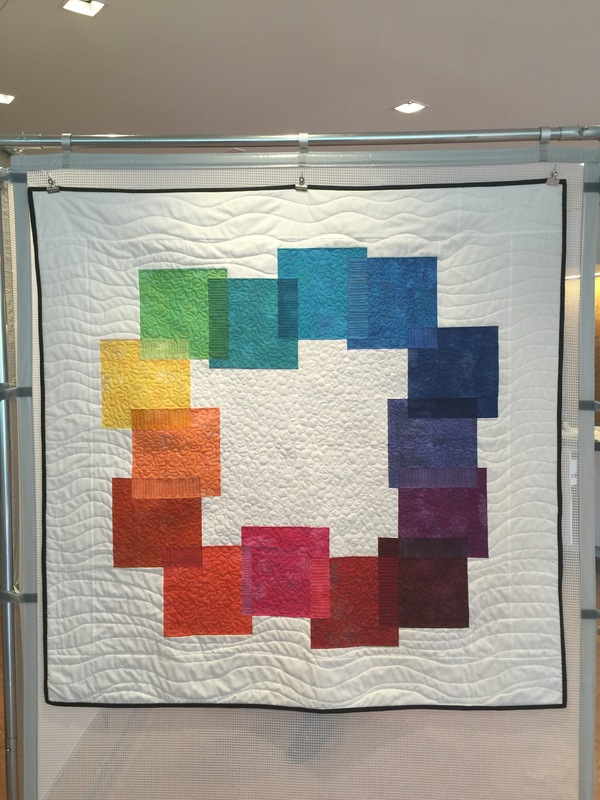 So I decided to make it early to have it ready to submit for QuiltCon 2017. 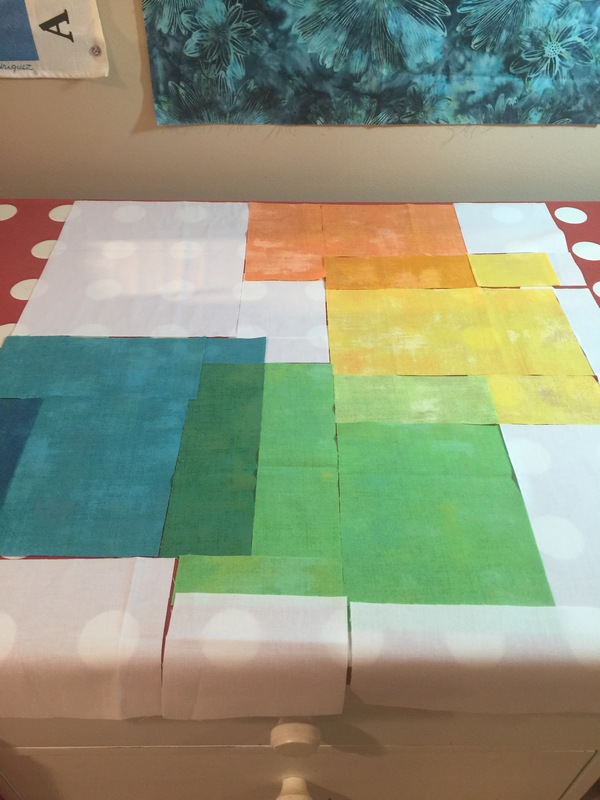 As it turns out, I will remake it to improve the quilting, notably the wavy horizontal lines. The general idea was to play with solid colors to make it look like shading when the blocks overlapped. After playing with solids, I decided to go with Moda Grunge as it added another dimension that I liked. I have another idea with solids that I am working on so I am glad I went with Grunge. 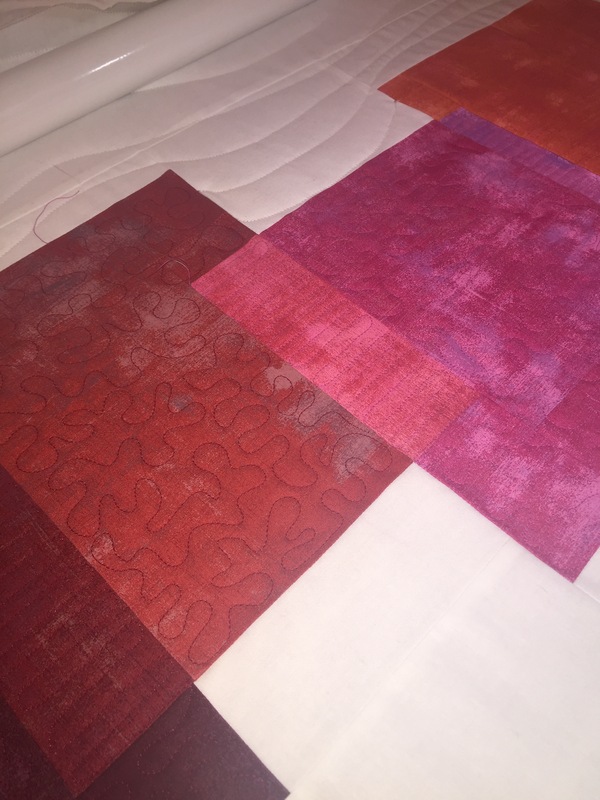 But then I started fabric shopping… And we all know how that goes, especially when Moda Grunge is involved. 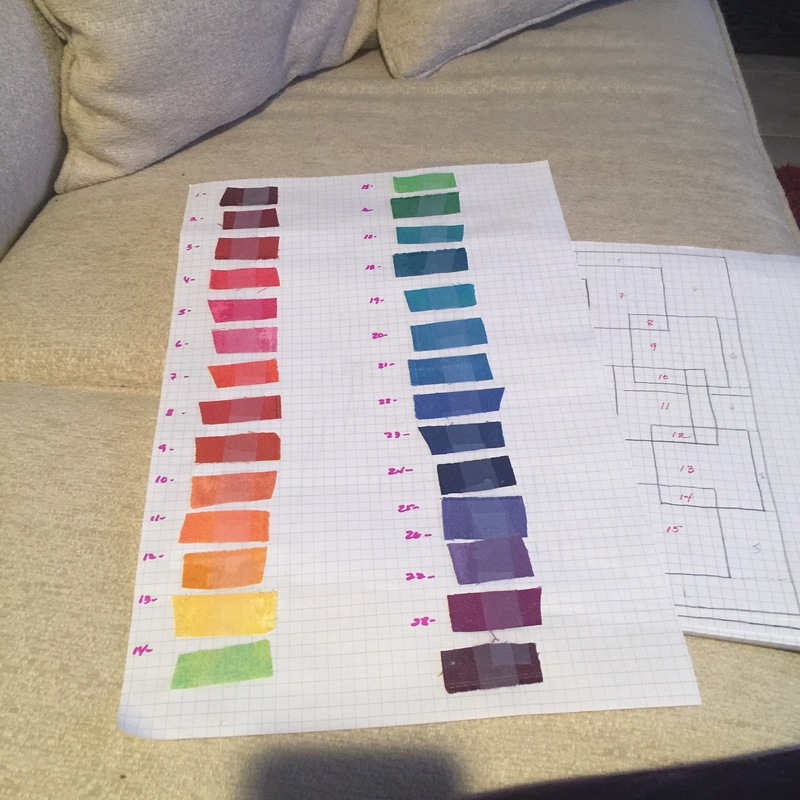 After getting the fabric I laid it out and then created my cheat sheet. That was critical because the cutting table was a mess once I got going. So I thought I would just start cutting and sewing, but quickly realized what a stupid plan that was. It would have worked if I were going for improv, but that isn’t what I wanted for this piece. Now I finally know why I took all those math classes growing up! 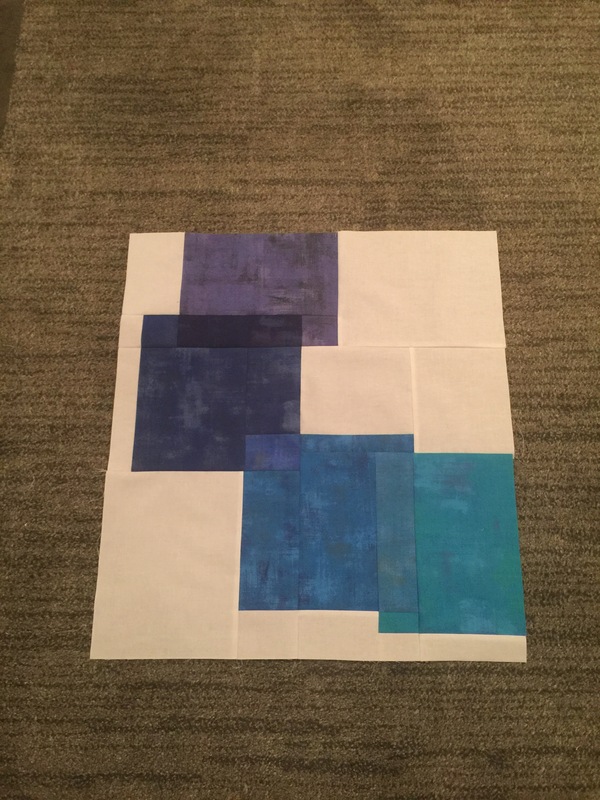 I then cut and laid out the pieces to make sure they made sense and created the right shape and overlaps before sewing. The quilting itself was good, and not good. My wavy lines are a hot mess but I really like the stippling on the solid colors and the back-and-forth on the overlapping pieces. I did change thread colors a lot as I wanted the color of the fabric to hold through without too much distraction. I had to use different thread brands which annoyed the machine. I will be consistent with Aurifil when I redo this. And now it is done. 😀 We have an “art at work” showcase today and I am excited to share this with my colleagues. More on that tomorrow. I also have to give a shoutout to my husband who was a great help – ironing, pinning, changing thread, cutting batting and refilling coffee – all critical tasks to finishing a project. So pretty and complex. Lots of planning…paid off! It’s a beautiful piece of art!!! Congratulations and have a good recovery from surgery. Oh my! 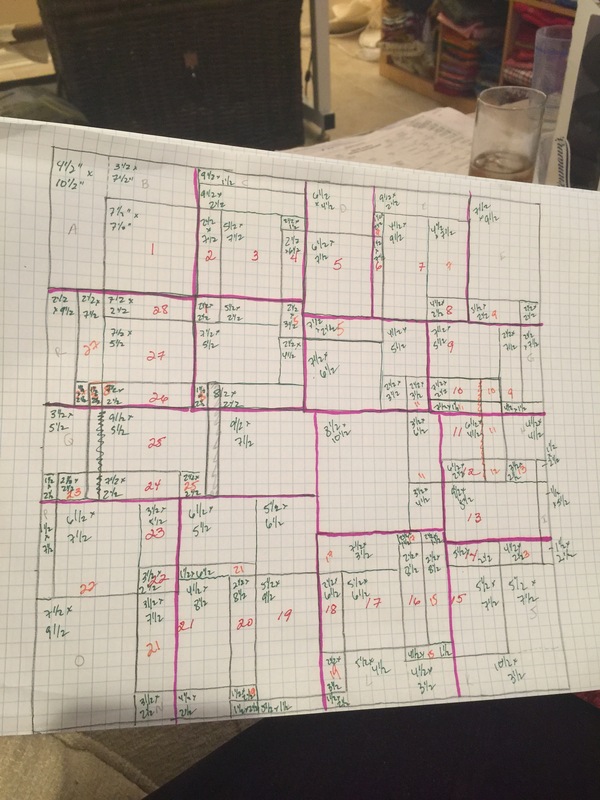 I LOVE this piece and am thrilled you put all the planning stages on the blog. 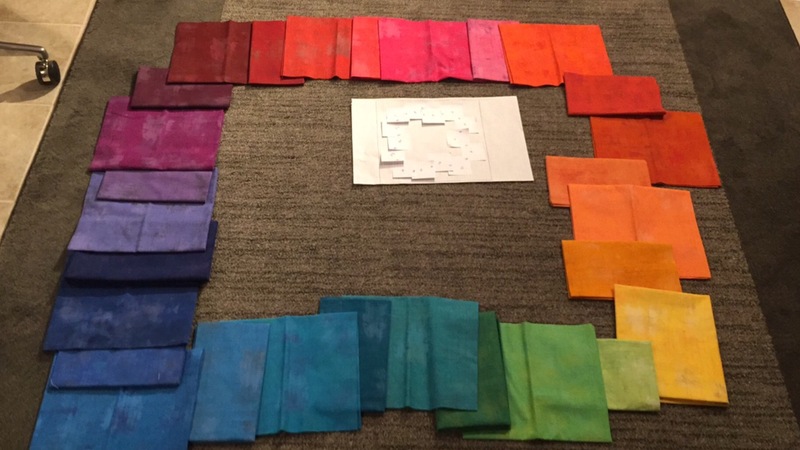 I do wish more of the non-quilting community could see what goes into making, what seems like a “simple”, quilt. 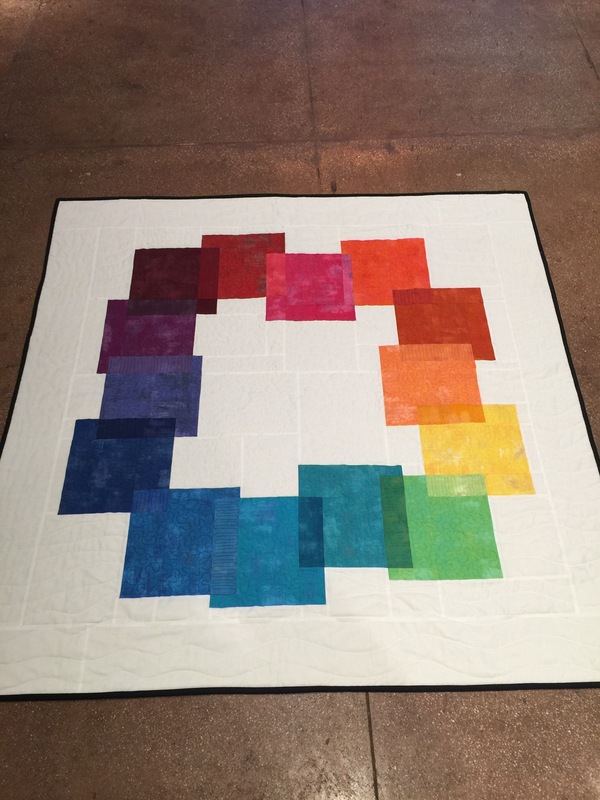 I agree that you should make another if you are to enter it at QuiltCon. Hope your recovery went went and you are back in action. Erin, I do NOT follow your blog but happened in today. Almost time for me to order a baby bib. 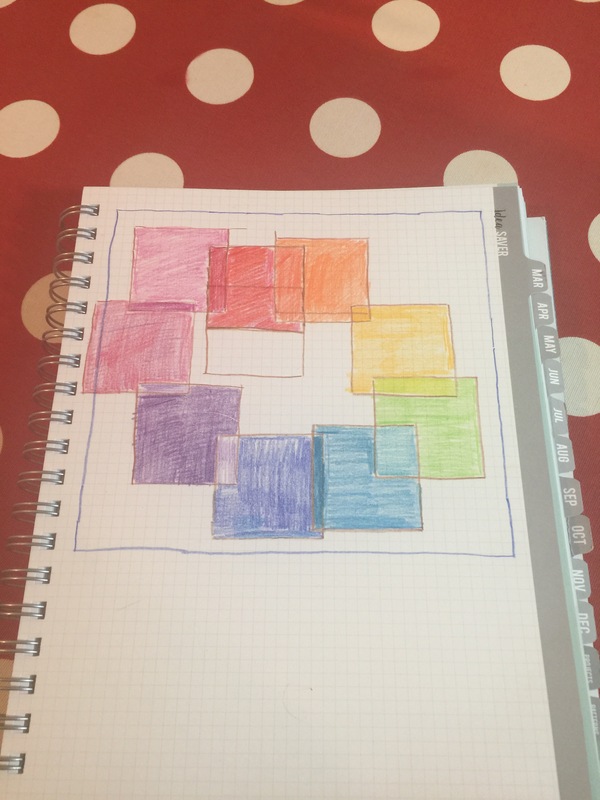 Ps… Open to any suggestions on the quilting. I liked what I did in the center and on the blocks bit don’t like the wavy lines.